Members of the new state Senate Ad-Hoc Committee on Indian Affairs met for the first time in Phoenix on July 15. On the committee is San Carlos Apache Tribal Chairman Terry Rambler, second from left. 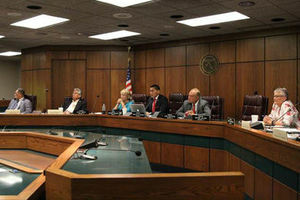 PHOENIX — A new state Senate committee made its debut July 15. The Senate Ad-Hoc Committee on Indian Affairs is designed as a joint undertaking between the state and the tribes. State Sen. Carlyle Begay, D-Ganado, said he launched the committee as a way to foster crucial relationships and open communication between tribal leaders and state government. Tribal issues often cut across party lines, so with this in mind, the committee was formed with Democrats, Republicans and tribal leaders as members to ensure balanced views and perspectives. During the first meeting, the committee received reports from the Arizona Department of Education on the status of Native American education, on the activities of the ADE Native American Advisory Council and from the Arizona State Board for Charter Schools. The committee also heard presentations regarding Native American Joint Technical Education District (JTED) program funding and the Indian School Bus Routes Maintenance Program. Representatives from the Goldwater Institute updated the committee on the status of the Indian Child Welfare Act lawsuit. Finally, the committee heard testimony from the public. The next Senate Ad-Hoc Committee on Indian Affairs will be in August. Gov. Doug Ducey has signed SB1332 into law, officially expanding the state’s innovate Empowerment Scholarship Account program offering unprecedented educational options to all students living on tribal lands, which includes 22 reservations in total. According to the Arizona Department of Education, Native American students have the state’s lowest graduation rate at 61 percent making Native children less likely to graduate than any other ethnicity or group including students with special needs. Arizona has the second largest Native American student population in the United States. Most of the 55,000 Native American students in Arizona attend school on or near their reservation. The new law gives these families on tribal lands, mostly in rural areas, the opportunity to customize their children’s education. Parents can choose how to use their state-funded education accounts and can pay for options like private school tuition, online classes, homeschooling or other education related expenses. The bill was sponsored by Sen. Carlyle Begay, D- Ganado, who has made education in his district, including the Navajo Nation and eight other Tribal communities, a top priority. With the new law, ESA eligibility now includes students in D or F rated schools, students with special needs, students in adoptive care, students with an active-duty military parent, siblings of an ESA recipient, and students living within the boundaries of an Arizona reservation.